Mr President, members of the Ringwood RSL, and former shipmates from HMAS Shropshire, there is a saying " Adversity makes strange bedfellows." In this case, out of the adversity and tragedy of the loss of HMAS Canberra at the Battle of Savo Island on August 9th. 1942, when 84 of her crew died, and a further 109 were wounded came the fact that HMS Shropshire, a sister ship in the Royal Navy was presented to the RAN through the initiative of Winston Churchill. "Australia have lost their 8 inch cruiser Canberra. It might have a lasting effect on Australian sentiment if we gave freely and outright to the RAN one of our similar ships. Please give your most sympathetic consideration to the project and be ready to tell me about it on my return. Meanwhile I will not mention it to anyone." 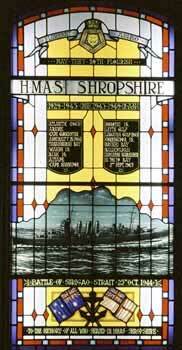 Thus Shropshire became HMAS on the 25th. of June 1943 when she commissioned under the commnad of Captain John Collins RAN. I was priviliged to serve in both Canberra and Shropshire. At her peak, the ship carried a crew of 1,280, and some 2,000 sailors served in her.They all formed a magnificent team, never to lose one man to enemy action. Shropshire was involved in 15 operations in the South West Pacific, we shot down 11 enemy aircraft, shared in downing another 8. At the Battle of Suriago Strait, the last great sea battle in history, the ship was involved in helping to sink the Japanese battleship Yamashiro. Finally we were present in Tokyo Bay as flagship of the RAN, for the signing of the Japanese surrender onboard Admiral Bull Halsey's flagship USS Missouri on Sunday the 2nd. of September 1945. A wonderful day for us all after 6 years of war at sea. David Mattiske who also served in Shropshire, was President of this Ringwood RSL Club up to the time the club was granted a licence. He has donated a print of a painting of the ship executed by Gold Coast artist Edgar Jackson. The original painting is hung in the Kevin Pagan VC Military Museum at Lismore Airport. It is both my privilege and pleasure to unveil this picture of a true Fighting Lady, and the best ship I ever sailed in. I give you all, HMAS Shropshire. Memorial window for HMAS Shropshire at Naval Chapel Garden Island Sydney.